Running with hubby to train for 5K, pushed double jogger up a BIG hill..
Life is good in TallMom land.. Yesterday I had an AWESOME day. *Started with winning a Book at Running with Boys THANK YOU! *Continued by reading the awesome Bloggy comments throughout the day (FYI the animals will be behind fences, we will not be running on the free-roaming tram path). *Jazzed that I was able to confirm some REALLY fun things coming in the mail to review. *And Tom at Runners Lounge liked my story about my half-marathon and awarded me Inspirational Story for June, which means I get to shop at Online shoes... SWEET!! *To top it off Muscle man texted and wanted to start our 5K training after dinner. Oh life can be soooo nice. 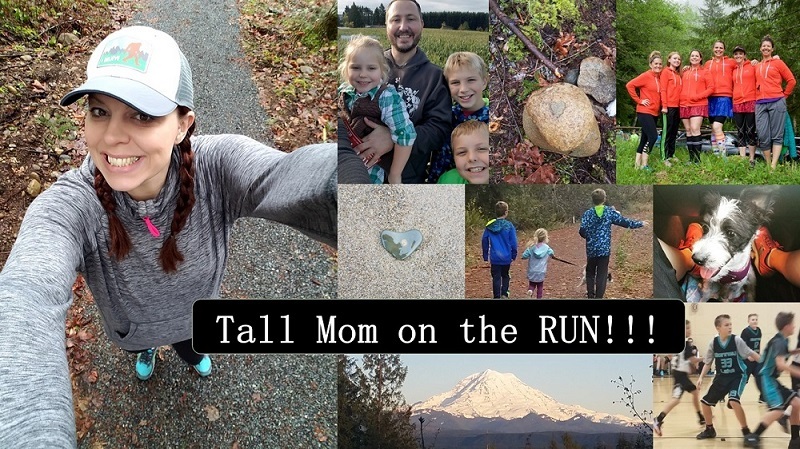 I have not posted any family photos lately....seems like the right time since we are embarking on FAMILY training.. Our run last night was TOUGH...funny how 2.4 miles can be hard when I ran over 26.2 miles just over a week ago. We traded off pushing the Studs in the double jogger... a little background I am 6'0, hubby is 6'3, our kiddos are in the 90-95% percentile for height and weight WE GROW THEM BIG. The combined weight of the Studs is over 75lbs and that does not include the jogger, not an easy push even going downhill it is HARD... I had the grand (Stupid) idea to try and push the jogger up the training hill. Oh I tried, I tried, I DIED... So we walked back down and kept on moving. We ended the run with me sprinting up another incline, with hubs huffing and puffing pushing the jogger behind. He is going to commit to running at least 3 times a week, instead of once or twice a month.. As a stay at home Daddy his time is a bit limited, but WE will figure it out..
OK so back to pictures....Check out Muscle Man (AKA Hubby, Hubs, David), and the little studs (Blaine-Nov. 05 and Easton- Jan. 08). To answer Ashley's question, yes my boys do have my dimple and they have their Daddy's blue eyes.future heart breakers for sure!! Seaside, Oregon June 2008 Hanging at home, the PJ's say "Mom's All-Star" I couldn't resist.. The furniture is kiddo friendly and will not be replaced until they know not to wipe Cheetos hands on the couch..
Love the photos - your boys areso cute! So much exciting stuff! family photos are so awesome. It will be fun to have photos from each year and look back at how they have grown! Good for you pushing that stroller up a hill. We won't take the stroller out anywhere but the trail as our giants are way too big. My husband is 6'7 and I am 5'9 so we have to giant girls to go with your boys. My 2 year old is as tall as a 3 1/2 year old. 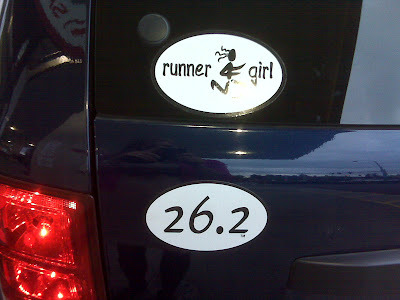 I have the same "26.2" sticker on the back of my car... next to another sticker that says, "I know I run like a girl. Try to keep up." Now your car looks just like mine! Your boys are so cute! Good work pushing them uphill. That's tough work, mama! wow jumping in to training with no time off, be nice to your body!! A fence? Well there goes my fast 5k theory, lol. Great job on the run with the kids, and I love the stickers!